This is Naruto Shippuden Uchiha Sasuke Adult Cosplay Costume in Men's Size. Same as the one Sasuke wore in anime. 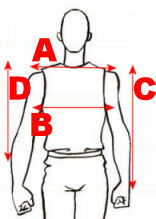 Include Jacket, Trousers and Belt. It is a great costume made by our own registered brand, so you will get the best quality with the best price. Brand new and the condition is great.